Haven't done any pony stuff for a while so here's a little piece of Rainbow Dash. A great piece. The wings remind me of this character from the comic "kill six billion demons"
Such a stunning picture. The background is so beautiful and Rainbow Dash looks so otherworldly. This is the kind of art that really impresses me. 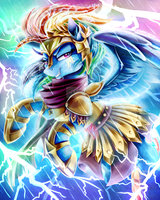 Archangel Rainbow Dash. Hmm, I like. Fantastic! The way the light focuses on Dash is neat and I love her Seraphim wings. It's a great pic and a great background and all, but the fact that Dashie has 6 wings...kind of reminds me of the description of Cocytus from Dante's Inferno...her expression doesn't, though. I love the blur effects how u use.